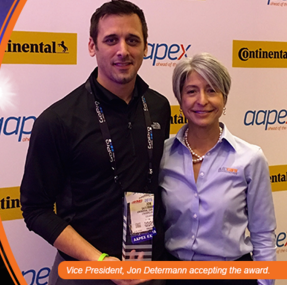 AAPEX announced the winners of the 2015 New Product Showcase during the General Session held at the Sands Expo in Las Vegas. A panel of AAPEX buyers determined the winning entries by vote. Voting took place on Tuesday, Nov. 3. “We’re glad we did as well as we had hoped. There were hundreds of great products competing, but the Universal Car Key is such a unique and special product­­we knew it would be a hit. We’re glad the AAPEX panel of buyers recognized our unique value proposition­­the world's first Universal Car Keys and Universal Car Remotes bring automotive key replacement back into the hands of retailers and repair professionals­­something that’s been absent for decades.” said Mark Lanwehr, President, Solid Keys USA. AAPEX represents the $477 billion global aftermarket auto parts industry, and is co­owned by the Auto Care Association and the Automotive Aftermarket Suppliers Association (AASA), the light vehicle aftermarket division of the Motor & Equipment Manufacturers Association (MEMA). Decades ago, car owners easily replaced keys at hardware stores and other retailers. In the 1980s, car makers began using high­security keys, resulting in key replacement business being shifted to car dealerships’ parts departments. In the 2000s, car manufacturers moved to “remote­head” keys, combining keyless entry remote functions and key blade into a single, integrated device. Aftermarket manufacturers of traditional high­security keys suffered because keyless remote technology was unfamiliar to them. Keyless remote technology is Solid Keys’ core competency, culminating in the 2014 release of the world’s first and only Universal Car Remote­­a universal keyless entry remote covering 20 car brands. Solid Keys leveraged this expertise in remote technology to meet the emergence of “remote­head” keys, and entered the replacement key industry. Their efforts have culminated today in its most recent offering­­the world’s first Universal Car Keys. With Universal Car Keys, hundreds of “remote­head” keys are combined into just a few keys. Stocking a few keys to cover millions of vehicles results in a dramatic reduction of inventory, helping shift lucrative automotive key replacement business back to retailers and repair professionals. Established in 2002, iKeyless is a privately­held technology company based in Louisville, KY. iKeyless specializes in the design, development, and distribution of automotive keys, keyless entry remotes, and related technologies.